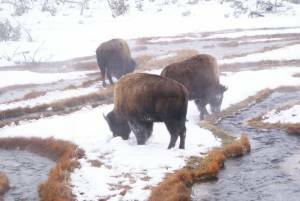 West Yellowstone, MT – At one point while cross-country skiing in Yellowstone National Park last February, I paused to consider my position — and the bison that was lumbering toward me on the ski track. Since I was on skis, I technically had the right of way. But since the buffalo had about 2,000 pounds on me, his point of view also bore consideration. Especially since he gave no indication that he was planning to abdicate his direction. This sort of interaction is exactly what one comes to Yellowstone to experience. It was just before sunset, not far from Old Faithful, the smell of sulfur thick and a hundred columns of steam emerging from the landscape around me. The threat of being trampled notwithstanding, it was a wondrous place to be. Yellowstone is one of the most popular national parks in the nation — but only in the warm weather. In winter, Yellowstone is a different world. Roads aren’t plowed. The landscape is white instead of green and brown. And visitors are counted in the hundreds, instead of the tens of thousands. 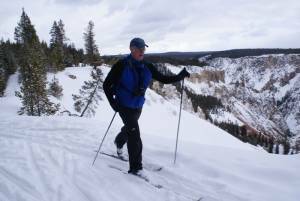 In February, I joined a small group on a five-day tour of the best of Yellowstone Region’s “muscle-powered” outdoor fun. What we found was that five days was barely enough time to scratch the surface of this snowy outdoor paradise. Local tourism professionals here used the term “muscle-powered” to distinguish us from most Yellowstone winter visitors — the snowmobile riders. A decade ago, Yellowstone, serviced mainly by its Montana neighbor, the Town of West Yellowstone, was known chiefly for the use of motorized sleds. Snowmobilers entered the park by the thousands each day, bringing noise and clouds of exhaust to the wilderness. 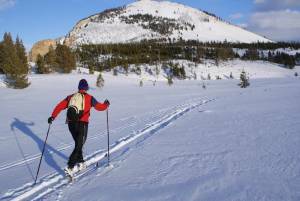 Cross-country skiing, where it existed at all, was the tagalong younger brother to the profitable and popular world of powered snow sports. That changed during the Clinton Administration, with concern about snowmobile impact on flora and fauna alike. Today, snowmobiling is still a popular activity in the park, but visitors are only allowed on guided tours, and only on the quieter and cleaner four-stroke snowmobiles. The loss to snowmobile business was a boon to nature lovers. 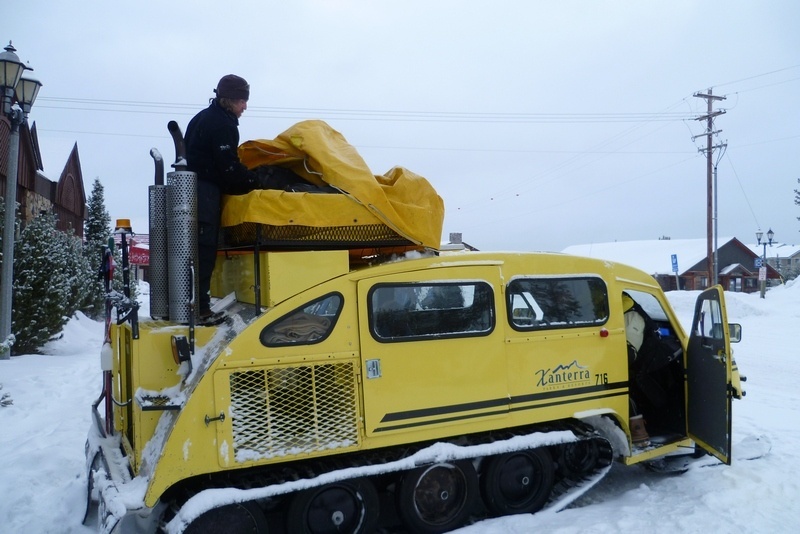 Now x-c groups head into the park by the hundreds all winter long via snowcoach (modern vans or “Bombadiers,” named for the manufacturer, with treads at the back and skis to steer) to watch the geysers go off, view wildlife and sample the trails on skis. In early February, I was one of them. Our visit began with two days in West Yellowstone, a tiny hamlet of just over a thousand set snug against Yellowstone Park’s western border. In this town, where T-shirt shops seem to outnumber street intersections, the side roads aren’t even plowed — better to accommodate the snowmobiles. Riders line up in the morning in packs heading into the park or to the miles of less-regulated trails in nearby National Forests. While we had no interest in snowmobiling, there was still plenty to keep us busy. We arrived in the evening from Bozeman, Mont. (the nearest airport, two scenic hours away). 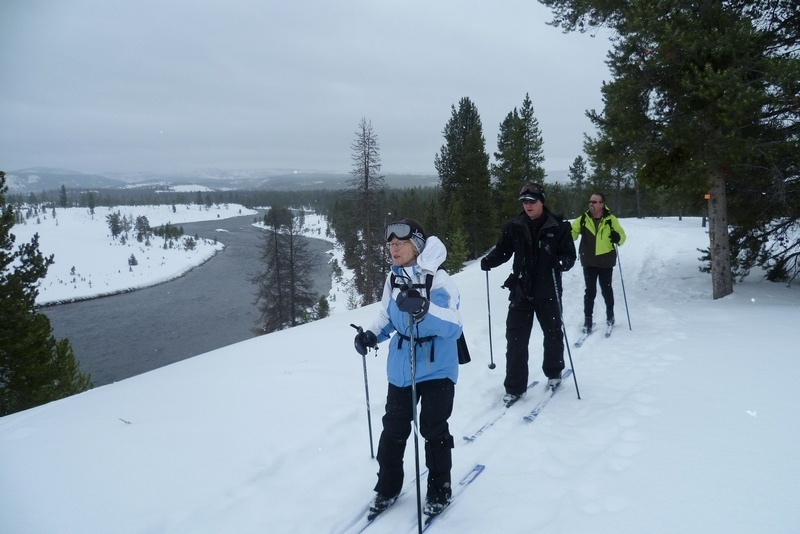 The next morning we rented skis from Freeheel and Wheel, the town’s bike/ski store, and joined co-owner Melissa Alder on a morning tour of the town’s best ski tour — the Yellowstone Riverside Trail. This beginner’s loop follows the Firehole River, which is kept warm by thermal features inside the nearby national park and thus never freezes. Wet snowflakes flitted down on this unseasonably warm February day, and the two-hour loop went quickly. Another trail worth exploring is the Refuge Point Snowshoe and Ski Trail, a 2.3-mile loop that explores an area decimated by a 7.5 magnitude earthquake. Located about 45 minutes northwest of town, the trail is worth it for the scenery alone. But if possible, take the snowshoe tour with National Forest Interpretive Ranger Joanne Girvin, who can describe the August earthquake come alive. At 11:37 p.m. on Aug. 17, 1959, a quake hit this popular campsite. In seconds, an 80-million-ton piece of mountain slid into the valley, burying 28 people and creating a new lake where a river had once been. The quake devastated the area, and trapped hundreds of campers for days until they could be rescued. More than 50 years later, Girvin stopped the hike every few minutes to tell us the story in minute-by-minute detail, and showing us old pictures of the calamity. Another fine place to ski is the Rendezvous Ski Trails, located on the edge of town. Thanks to the high elevation of 7,000 feet, this 35-kilometer network is one of the first Nordic trail systems to open in the winter, drawing the U.S. Biathlon Team here for practice in November. On the day of my visit, Rendezvous had two events — the “Spam Cup” race, which I missed (but apparently involves skiers dressing up as their favorite luncheon meat) and “Taste of the Trails,” where skiers come from miles around to ski the trails while sampling food cooked by local chefs. Not that we were hungry. The food in town never disappoints, with a half-dozen local restaurants offering fresh elk, bison and trout along with the usual staples. It helps if you like huckleberry, a locally-grown fruit that is used for everything from salad dressing to bison steak sauce. With our base at the West Yellowstone Holiday Inn, we stuffed ourselves every night at, respectively, The Branch, Serenity Bistro and Madison Crossing Lounge. Every meal was splendid. While the skiing in West Yellowstone is quite good, the town serves as an appetizer for the main attraction — Yellowstone Park. On our third morning, we awoke early to board a Bombardier — a teardrop-shaped snow buggy designed to drive on Yellowstone’s unplowed roads. With our gear tied down on the roof, the five of us piled in the back and Zach, our long-haired driver, chauffeured us into the park. After a noisy two-hour drive — with a few stops to photograph buffalo and elk — we arrived at Old Faithful, the park’s most popular attraction in any season. In summer, thousands of people would stream through here each day. But in winter, visitors are limited to snowmobile teams (max: about 300 people per day), snow coach tours and overnight guests of the Old Faithful Snow Lodge. The lodge is a well-appointed hotel, with rooms starting at $206 per night, although cheaper lodgings can be had in adjacent “Frontier Cabin” for under $100. 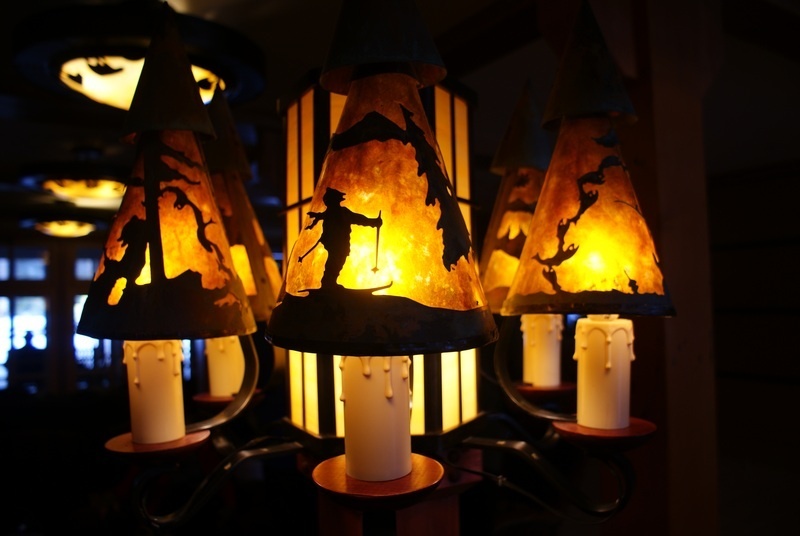 Either way, you’ll want to eat at the hotel’s Obsidian Dining Room, with an eclectic menu that includes elk (a bit tough) and bison (delicious). Food in winter, like everything else, is brought in by snow coach. The Old Faithful Geyser Basin is world-renowned for its thermal features, and in winter you can watch the namesake geyser erupt with only a few people. But it’s not the best place for skiing. All that steam makes for icy conditions, and skis aren’t recommended on the boardwalks that surround the geysers. 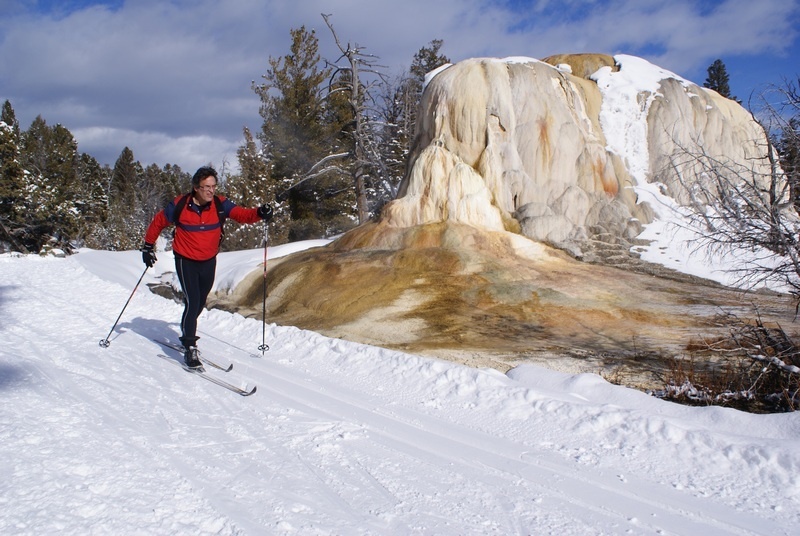 The best ski trail from Old Faithful is the route to Lone Star Geyser, located several miles to the south. The trail follows a small river to the geyser, which had just erupted and was belching steam upon our arrival. It also gives the skier an opportunity to leave the relatively busy Old Faithful area to enter the backcountry. In late afternoon I skied to nearby Biscuit Basin, several miles away. The trail had melted in places, and park staff had tacked Astroturf on the ground to allow skiers to bridge the gaps without stopping. It was a pleasant journey, made even more interesting by the two coyotes I saw. It was there where I played a brief game of chicken with the aforementioned bison. They stand still and stoic in all seasons, lolling tourists into a false sense of security (tourist injuries from charging bison outnumber bear attacks). 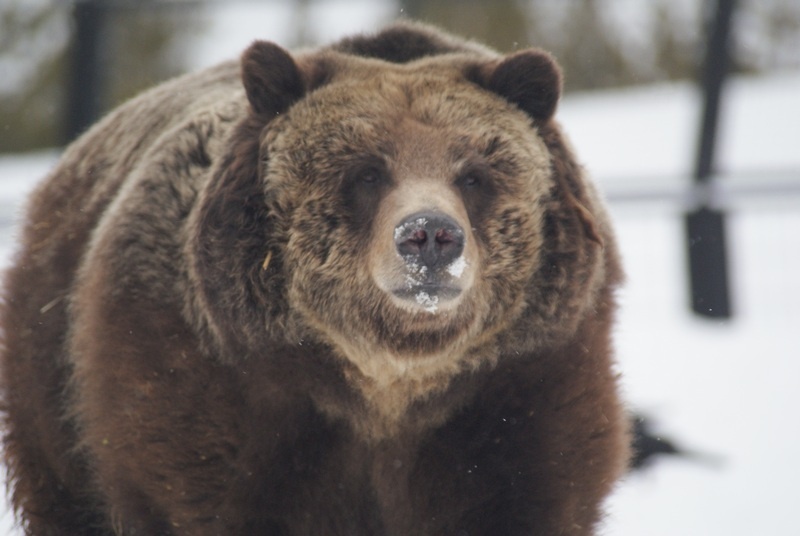 In winter, their brown muzzles are covered by snow — they sweep their massive heads side-to-side in the drifts, in an effort to look for grass. Bison are majestic and proud, the symbols of the prairie. But they are also wild animals, with bad eyesight and a quick temper, and can attack with little provocation. As the buffalo wandered toward me, I considering my options and I left the trail to gave him a wide berth. He continued down the ski path without giving me another look. The next morning, we returned to our Bombardier and headed off to the Grand Canyon, a yellow gash in the earth carved by the Yellowstone River, the longest un-dammed river in the Lower 48. I was thrilled to be going here, because it was this spot that first got me interested in a winter Yellowstone visit. In 1978, National Geographic printed an article by the “winterkeeper” of the Canyon Village. At the time, Yellowstone had few visitors and so much snow it was a full-time job to keep park buildings from collapsing from the weight. Keeping up with the snow was considered the hardest job in the National Park System. I mentioned to a few park employees my fascination with this article, and was told, “Oh, you mean Steve Fuller. He still works here.” I immediately asked employees of park concessionaire Xanterra if I could meet him. After a long drive across the park, our group arrived at the Canyon ready to ski. And here is what must be one of the most scenic x-c ski trails in the country. This rim-side route gives constant views down into the canyon, with enough small hills and curves to never let you forget that it’s a thousand-foot drop down steep, crumbling walls to the boiling river below. It was hard to ski, but only because I kept stopping and taking pictures. The only problem is it’s short — less than a mile long. Before you know it, you’re back in the parking lot and the yellow Bombardier is waiting for you. Canyon is a beautiful area, and a longer ski trip can be conceived by looping some of the unplowed roads with trails around the Visitor’s Center. But still, given the time it takes and the expense (more than $100 for a day’s round-trip from Old Faithful) it’s not the best winter destination in the park. I also never got to meet Fuller. No one seemed to know where he was. I guess I’ll have to come back — no doubt he’ll still be here. From Canyon we drove to Mammoth at the northwest corner of the park. Just outside the village, the roads became plowed and we transferred from our snow coach into a waiting tour bus. It seemed we were back in the real world. Indeed, Mammoth — park headquarters — is a relatively large village that feels more like an Army base than a national park. That’s because the U.S. Army ran Yellowstone before the modern park service was created. Yellowstone was established in 1872, making it also the world’s oldest national park. It took a few decades for tourism to catch on, but the advent of the automobile age helped ensure that Yellowstone would always have a continued stream of visitors, even in winter. Mammoth, named for the famed terraced hot springs on the edge of the town, is served by what must be the best hotel deal around. You can get a room, without bath, for about $80 a night. The hotel itself is a bit Spartan, with oppressively hot radiators (I kept the window open) and a hallway look that says, “consumption ward.” Historical pictures line the walls, but for some reason the same three or four black-and-white photographs are repeated ad infinitum down the hallways. Still, it’s comfortable and cheap and there’s a library with a beautiful United States wall map made of 50 different kinds of wood, which shouldn’t be missed. There’s also a stellar restaurant across the street. Mammoth is the easiest place in the park to drive to in winter, as the roads stay open all year long and Bozeman is only 90 minutes away. It also has the best cross-country skiing, which makes it an attractive destination for those with limited time or money. One afternoon, we rented equipment and went out for a three-hour ski tour, starting at the hot springs and quickly climbing into the woods. The trail was absolutely breathtaking, with a new mountain view every five minutes and not a soul to be seen. On the return trip, skiing the snow-covered road, we were passed by a group of park employees on snowmobiles, telemark skis lashed to the back. Clearly, for those who live and work in this park, there are plenty of turns to make. But the reason many people come to Mammoth in winter are the wolves. Wolves have always been around Yellowstone, but hunting in the early 20th Century ensured they were killed off by the 1940s. 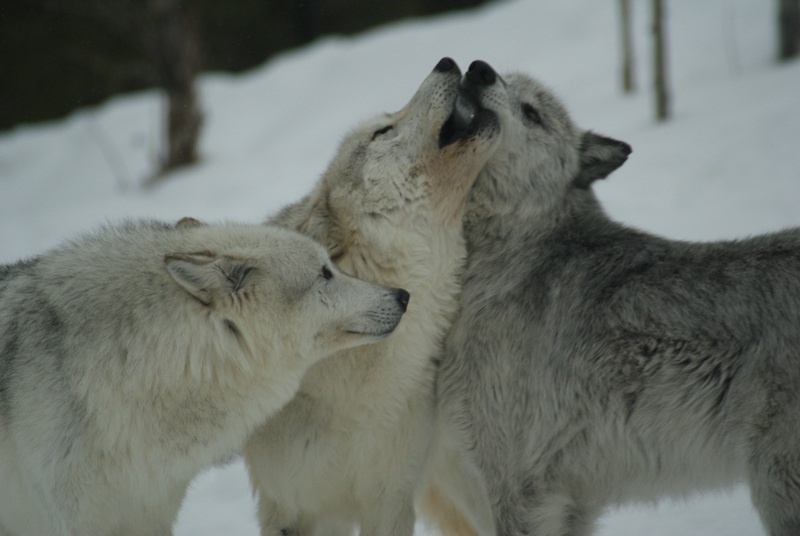 After decades of discussion, wolves were re-introduced in 1995 amid a hail of controversy. Today, there are more than 300 living in and around the park. While the controversy has never stopped — and hunting has been reintroduced in several states surrounding Yellowstone — the existence of thriving wolf packs has resulted in a new kind of tourism, as people come by the dozen every day to listen to and watch one of nature’s greatest predator in action. On our last full day in the park, we climbed aboard yet another bus to see the wolf packs for ourselves. The wolves are not hard to find. Just look for a row of tourists with spotting scopes on tripods, perched on the side of the road. The wolf-groupies (“wolfies?”) were all abuzz because only a day earlier they had witnessed a pack take down a bison. In fact, some of the wolves had run right by the humans as if they weren’t there. We didn’t witness anything as dramatic. But we did see the park’s biggest pack, known by naturalists as the Mollies (all the packs have names). These are some of the most-studied wild animals in the world, so much so that every wolf has a name and avid watchers can even discuss their personalities. The packs have rigid territorial boundaries, and wolves from various factions occasionally mix it up (imagine the opening scene from “West Side Story” with wolves instead of teenagers with greasy hair). We didn’t see any fighting that day either. But we did hear the howling. It starts with one, far off, in the trees. Then, one after another, the rest join in. If you’re watching through a scope, you see their muzzles turn to the sky, and then a second later it hits you. The sound is both soul-stirring and timeless. It is a beautiful harmony that sends chills down your spine and brings tears to your cheeks. Everyone stops talking when this unearthly music comes drifting over from the hills. And when you’ve heard it, you know your visit to Yellowstone is complete.